After some shuffling, the annual UFC event at Madison Square Garden is finally upon us with a main event that finds Daniel Cormier defending his UFC heavyweight title against Derrick Lewis at UFC 230. Also featured on this card is Chris Weidman looking to please his New York following by taking out former Strikeforce champion Jacare Souza, who steps in on short notice after Luke Rockhold was pulled due to injury. Israel Adesanya squares off with Derek Brunson as “The Last Stylebender” can push his rising star into the stratosphere with a victory. This and so much more at UFC 230 and the Sporting News staff offers our predictions on the promotions’ fourth entry in NYC. As much as I love Derrick Lewis, he lacks technique. He doesn’t do much to set up his big power shots and often catches opponents who decide to mindlessly stand and bang with him. Daniel Cormier is far too cerebral for Lewis and knows that utilizing his wrestling and clinch work will eventually wear down “The Black Beast.” Cormier won’t make this exciting and will do exactly what he has to in order to win the fight. With his gas tank on empty, DC will retain with a pummeling of Lewis that will be more due to a lack of cardio than Cormier’s punching power. At some point in this fight, Derrick Lewis is going to swing and drop Daniel Cormier with his dynamic punching power, landing DC in serious trouble. 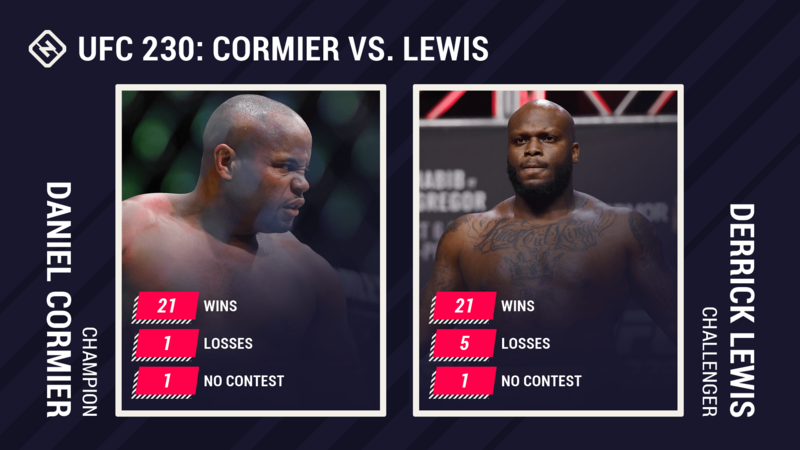 I’m tempted to go with Lewis knocking out Cormier. But the more I think about it, Cormier’s veteran savvy will allow him to rebound nicely and catch Lewis slipping at some point to pour on his own punches until the ref steps in. That’s my prediction, although this could just as easily go the other way and I wouldn’t be surprised. This is going to be a tougher fight for Cormier than people think. Lewis hits hard and most importantly, he’s in fighting shape after competing four weeks ago at UFC 229. Cormier wasn’t training when he got the call as he was coming off a hand injury For Cormier to win, he’s going to have get Lewis to the ground early and wear him down from there. If the fight stays standing and goes into the later rounds, Lewis has the advantages. Cormier has grand plans of Brock Lesnar and Jon Jones before he retires in March. Lewis is going to shock the world and derail the party train. Everyone thinks this is going to be a cakewalk for Daniel Cormier and it probably will be, but the thing to remember is that Lewis lost more than 14 minutes of his three-round fight with Alexander Volkov and will still be standing in the cage, challenging for the heavyweight title on Saturday night because he landed a couple clubbing blows in the final 30 seconds of the contest. He’s limited and Cormier should dominate, but Lewis is also incredibly dangerous at all times. Having said all that, I see Cormier being smart and conservative — taking the fight to the ground early and either finding a submission or just grinding Lewis out on the ground. There is no reason for him to take any real risks in this fight and I think it leads to a tactical, safe fight for DC. There’s something about Chris Weidman that is troubling. Despite his submission victory over Kelvin Gastelum, Weidman has been far from the dominant force that was once the middleweight champion. He’s been close to being finished – or just flat out finished – far too many times and that’s beginning to take its toll on the former champion. Fortunately, Jacare isn’t known as a dangerous striker. However, if he hurts Weidman at some point and drags the fight to the canvas, he could put “The All American” in a tough spot. It’s going to be controversial, but I see Jacare squeezing by. Look for “The All American” Chris Weidman to use his wrestling and overall grappling skills to grind out Ronaldo Souza effectively in this one. If Souza does get fatigued at any point, Weidman is going to land heavy shots that do damage. Weidman, a Long Island, New York native, was a fan favorite during open workouts on the Madison Square Garden floor Wednesday. Expect the hometown guy to give his fans their money’s worth. This is a showdown fight fans have wanted to see for a long time. Weidman had been set to rematch Luke Rockhold. But Rockhold bowed out due to injury and Souza got removed from his bout on this show with David Branch and moved up to this one. Weidman hasn’t fought since July 2017, when he snapped a three-fight losing streak against Kelvin Gastelum. Souza comes in having lost two of his last three. It appears father time is starting to catch up with Souza. Does he have one more run in him? A win for Weidman puts him right back in the title picture, but can he pick up right where he left off or will the cage rust prove to be a factor? The clock is ticking for Souza and Weidman wins a thriller in his home state. This one is tricky because both are well-rounded and talented, but also capable of giving away rounds and coming out flat. Weidman hasn’t fought in 15 months and Jacare is coming off a middling effort against Kelvin Gastelum, who Weidman beat last time out, which only further muddies up the waters in this one. All things being equal, I think Weidman should get the win — his wrestling is better than Souza’s, he won’t get stuck in any compromising positions on the ground and while he is probably a step or two behind the Brazilian in terms of speed, I think he’s a notch above Souza in the power department as well. It will be a close, technical affair, but I think Weidman comes out on top. This short notice fight does Cannonier no favors against an opponent who has been overlooked throughout his career. Branch does a lot of things very well and will take advantage of an opponent who is 1-3 in his last four fights. Cannonier’s only chance is to catch Branch asleep at the wheel, but the former two-division world champion in WSOF will snuff out that game quickly and pound out Cannonier in the second frame. Sixty percent of Jared Cannonier’s wins have come via knockout. But he won’t increase that percentage this time around. Wouldn’t be surprised if Cannonier swings with lights-out intentions, misses and David Branch makes him pay to earn the stoppage. Branch was set to face Souza as we mentioned above and Cannonier stepped up to the plate. Branch is 2-1 since he returned to the UFC, including a first round TKO over contender Thiago Santos in April. Cannonier had been thought of as a highly touted prospect. The 34-year-old has struggled mightily recently, though, having lost three of his last four bouts. Give Cannonier credit for stepping up to the plate, but Branch should have an easy time and remain a top contender at 185 pounds. With all due respect to Cannonier, who did okay competing as an undersized light heavyweight and should be a better fit in the 185-pound ranks, he’s in over his head here, especially on short notice. Branch doesn’t get enough respect for the career he’s crafted for himself and what he brings to the table. I think we see the full range of skills in a quick, dominant performance on Saturday night. Whether he catches the hittable Cannonier and finishes him with strikes or gets around to his back and chokes him out, I think Branch gets an early finish. Brunson’s lack of polish in his striking is going to cost him big time here against the rising star known as “The Last Stylebender.” The bad blood won’t help, either. Adesanya has continued to improve defensively and may have to endure a first round where Brunson looks to deploy his wrestling. After that initial charge, Brunson will likely resort to striking and find himself on the wrong end of a counter strike that will send him to sleep. You already know what Derek Brunson is going to do — charge at Israel Adesanya throwing with nothing but bad intentions. But will that aggressive style backfire against “The Last Stylebender?” I’m going with yes, as I think Adesanya will catch Brunson and hurt him enough to end the bout and stay undefeated. And I wouldn’t be surprised if he does it with his feet. Adesanya is the most exciting prospect in the middleweight division. He’s undefeated through 14 fights, with 12 of those victories inside the distance. After losing back-to-back contests, Brunson’s won two of his three. This has the makings of a coming out party for Adesanya. Brunson is the measuring stick of where you are at in the division. If the 29-year can defeatt Brunson, he’ll be well on his way to becoming a title contender. On one hand, Brunson’s power and wrestling abilities might present an interesting challenge for Adesanya, who has shown good takedown defense, but also hasn’t fought anyone with Brunson’s background and proven skills in that area. On the other hand, the fact that he keeps his hands low and tends to rush into exchanges with his chin held high makes me think that “The Last Stylebender” is going to hit him with the kind of combination straight out of Street Fighter V and end this one early. Adesanya looks like the real deal to me and this fight could convince a few more people of that fact. I was concerned with Eubanks making weight and sure enough, she failed to make the flyweight cut Friday. Still, Eubanks has been exceptional during her run on TUF and beating Lauren Murphy proved that she has what it takes in this division. She’s already defeated Modaferri (unofficially) once and she’ll do so again at UFC 230. Let’s not forget that Sijara Eubanks was originally supposed to headline UFC 230 against Valentina Shevchenko. However, a Daniel Cormier-Derrick Lewis main event changed those plans much to the chagrin of Eubanks. “SarJ” has a chip on her shoulder because of that and she’s likely to take out all her frustration on Roxanne Modafferi. Eubanks defeated Modafferi on TUF 26 by unanimous decision and I see her rematch against “The Happy Warrior” going the same way. Eubanks won the first fight by unanimous decision in November 2017, controlling the action in every facet. We should see the same results the second time around. Eubanks wants to make a statement and show the world she deserves a shot at the belt, although not making weight Friday might affect that possibility. Modafferi has improved by leaps and bounds since her first stint in the UFC, but she’s still fairly rigid with her striking and more technical than dangerous on the ground. While she normally has an edge over everyone on the canvas, Eubanks is a high-level black belt as well and should be able to hang with Modafferi if the fight hits the floor. On the feet, she has a significant advantage and should be able to outwork the fan favorite on the way to a win on Saturday night.